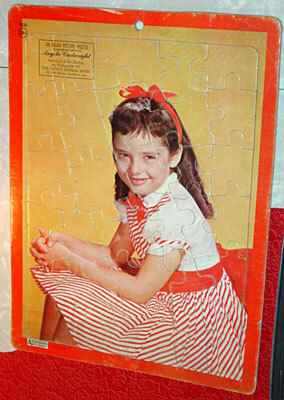 This wonderful vintage puzzle comes from an old northern New Jersey home recently liquidated. 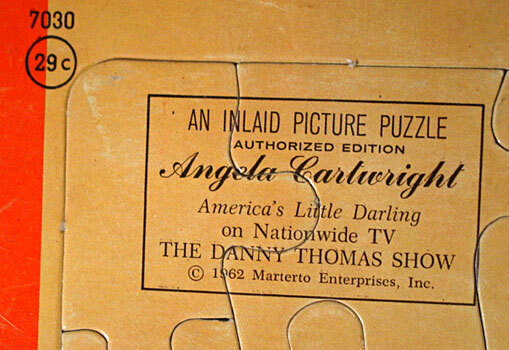 Made by "Saalfield Artcraft - Made In U.S.A." Upper left reads "An Inlaid Picture Puzzle - Authorized Edition - ANGELA CARTWRIGHT - America's Little Darling on Nationwide TV - THE DANNY THOMAS SHOW - � 1962 Marterto Enterprises, Inc." Cartwright would shortly blossom into "LOST IN SPACE" starring Penny Robinson! 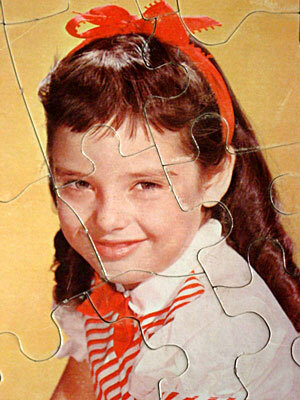 The puzzle measures approx. 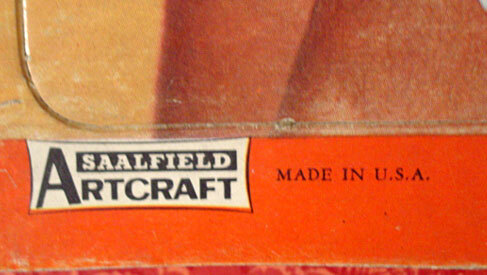 14" by 10.5". Complete w/ all pieces intact. Overall nice condition - it does have some age/surface wear - two puzzle pieces have very slight edge separation of image from cardboard underside (nothing a tad of Elmer's glue won't fix. A very unique piece for any Cartwright collection!